On 27 September 2007, Nelson Mandela officially opened one of the biggest shopping centres in South Africa, Maponya Mall, in Soweto. The R650-million centre – which houses more than 200 stores and boasts a cinema complex – was the realisation of a lifelong dream. This article takes a look behind the scenes at the life and times of business titan, “father of township entrepreneurship” Dr Richard John Pelwana Maponya who turned his dreams into reality. he was denied a licence – despite the attempts on his behalf of the first black law firm in South Africa, Mandela and Tambo. Maponya’s links to the Mandela family became more formalised when he married Marina Nompinti, cousin to Nelson Mandela and together he and his wife took the next step on the journey to the creation of the Maponya empire with the opening of Maponya Dairies, which delivered milk by bicycle to customers in the 50s. In 1965 Maponya founded and became president of the National African Chamber of Commerce (NAFCOC) a voluntary business support organisation focused on the “economic emanicipation of small to medium businesses in township and village economies”. 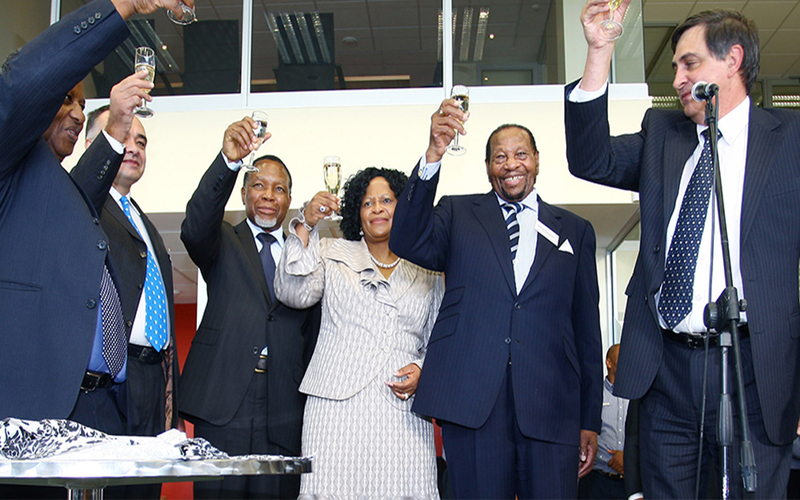 The 70s saw an expansion of Maponya’s business interests growing to include bus services, a funeral parlour, motor dealerships, petrol stations and a BMW franchise. Speaking of the BMW franchise, when Richard Maponya and his wife Marina visited Madiba in Victor Vester prison, he confided in them that he was going to be released in the near future and when that happened he would really like to be collected in a BMW. Maponya organised a fleet of 10 BMWs plus chauffeurs to arrive at Lanseria airport and had the honour of driving Madiba and Winnie Madikizela Mandela from the airport and then again to the making-of-history moment at the FNB stadium the following day. Maponya’s nephew Michael remained Madiba’s chauffeur for the rest of his days. Eleven years after the advent of South African democracy, Dr Maponya received one of the highest orders of the land – the title of Grand Counsellor of the Baobab in gold “for his excellent contribution to entrepreneurship despite oppressive apartheid conditions, and for serving as an inspiration to disadvantaged South Africans striving for business success”. “Today’s opening of these dealerships does not only mark another milestone for the Maponya Group and indeed the people of Soweto, but also, it tells a moving story of the tenacity of the human spirit to refuse to give in to impediments subjectively imposed on human life. “In many ways this story is told through the trials and tribulations of Dr Maponya’s years of commitment and giving to the Soweto community, starting from his days as a milk man on bicycle to the development of the multi-million rand Maponya Mall. “It is not merely a rags to riches story, it is far more than that. It is a symbol of what it meant to be black and to refuse to be defined by arbitrary apartheid laws and the colour of one’s skin. In April 2016 the Order of the Baobab in gold was bestowed posthumously on Marina Nompinti Maponya “For her exceptional contribution to the field of entrepreneurship at a time when economic development for the majority was proscribed. Her selfless giving to poor communities remains her legacy”. The emblem of the Maponya Africa Group of which Richard Maponya is CEO, is an elephant, symbolising wisdom, fearlessness, and community. The holding company includes subsidiaries as diverse as mining, energy, transport, business technology and learning. Renowned for being a leading racehorse breeder and owner, Maponya challenged the white-only hegemony “sport of kings” by applying for an owner’s licence in the 80s. It took five years before his application was approved and finally when his jockeys took their places on the circuit, they were proudly wearing the ANC colours, green, black and gold. He called the first horse he bought “Another Colour”. Dr Maponya has eight children and eighteen grandchildren and is founder and trustee of the Nelson Mandela’s Children Fund. I’m impressed by Dr Maponya’s wisdom shown by his foresight, mental tenacity, resilience and humility. The black race definitely need the likes of him and it is no coincidance that when he met Mandela their DNA’s harmonised well. My humble request is that he should write a book to encourage our people and show that we need not imitate or mimick other groups to succeed in life.